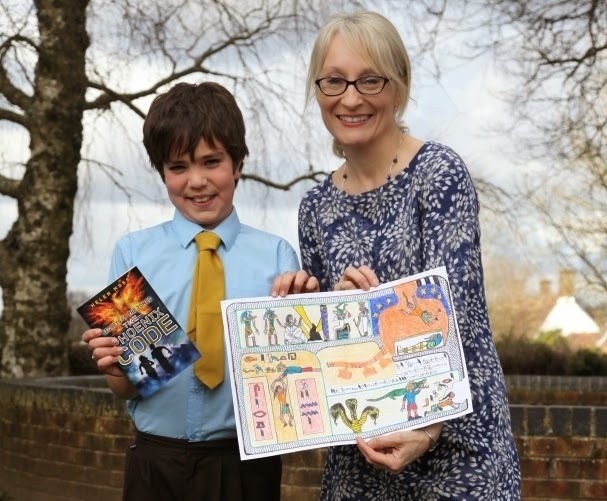 Serge is ten years old and is a pupil at Ropley School, Hampshire. By chance, I was visiting his school this week and so had the great pleasure of presenting the prize in person. It was lovely to meet Serge and his Mum and brother and sister. All the other children in the school had great fun sharing his success - they gave Serge several massive rounds of applause! The local paper even came along to take pictures. Well done, Serge, for a truly fantastic drawing. Every time I look at it, I notice a new detal. Serge's prize is to have a character named after him in Secrets of the Tombs Book Three. It won't be out until Summer, 2016, but when it does come out, you can look out for him! 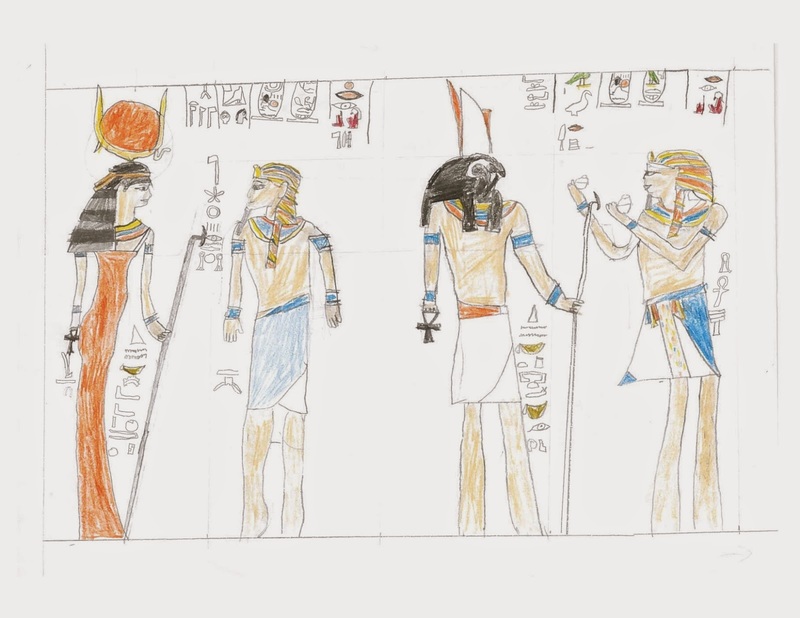 This beautiful drawing is so graceful and really captures the black and russet shades of many tomb paintings. The bennu bird is a central theme of The Phoenix Code, so this was a perfect choice of scene to draw. I love the delicate shading of the bird's plumage. 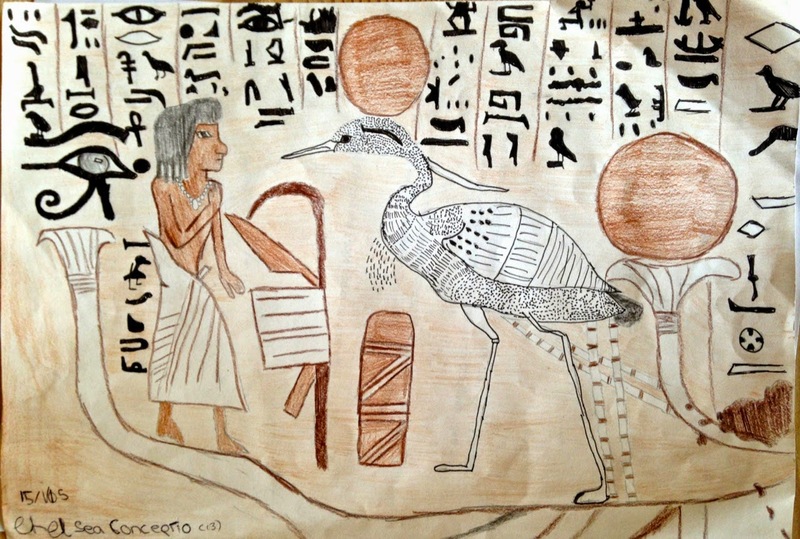 This picture really appealed to me because it shows one of the key scenes in The Phoenix Code; the entry into Nefertiti's tomb. 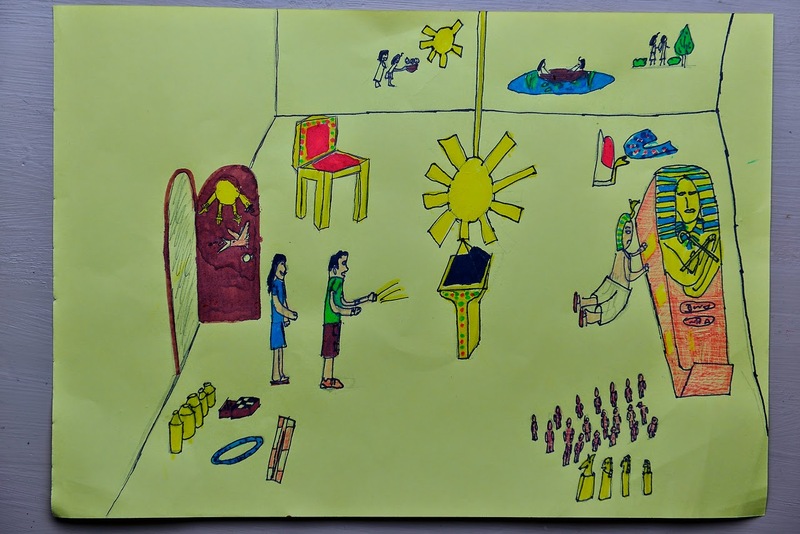 Jed has included lots of the details that I describe in the book, including the gold sun hanging above the benben stone, the wall paintings and the patterns on the door. Chelsea and Jed will both receive signed copies of The Phoenix Code and some other book goodies from Orion Children's Books. 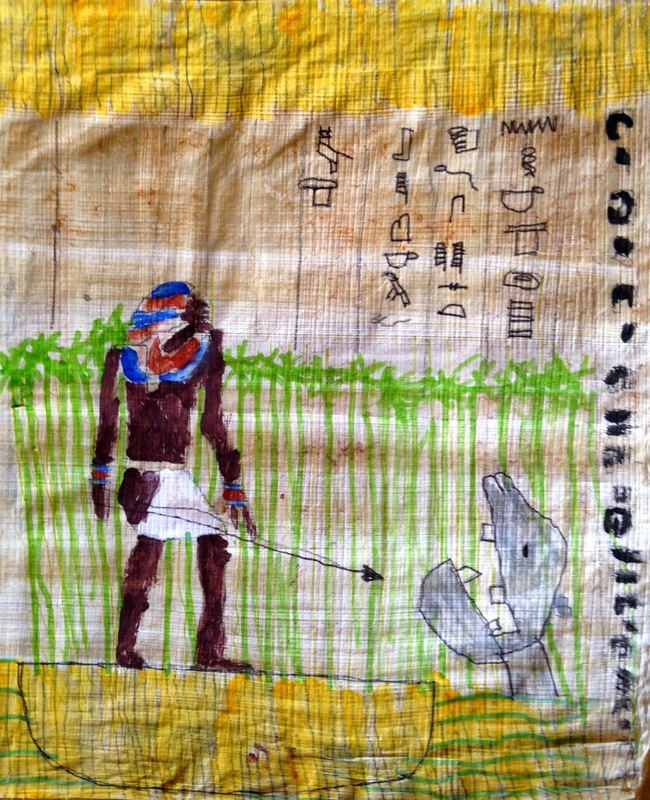 I love Aitan's picture of hippo hunting on the Nile - especially as it is painted on real papyrus. 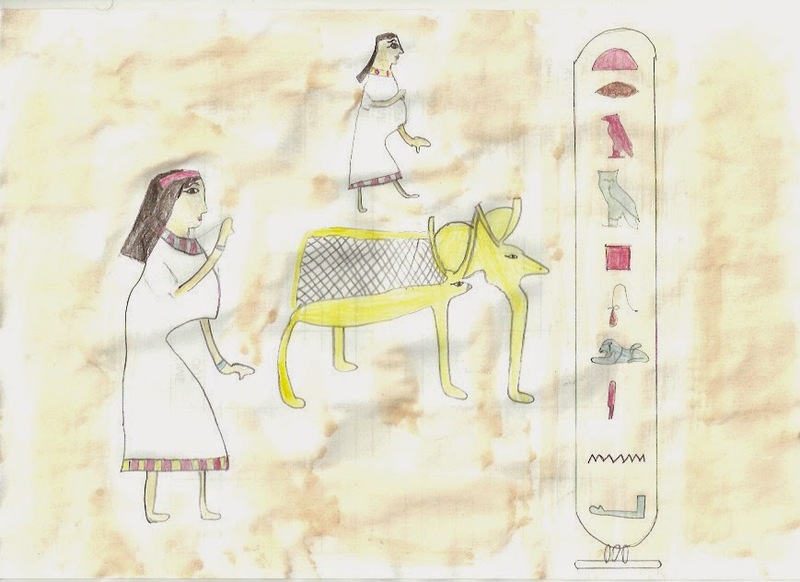 Camilla's picture of an Egyptian wall painting is so delicately drawn and beautifully coloured. 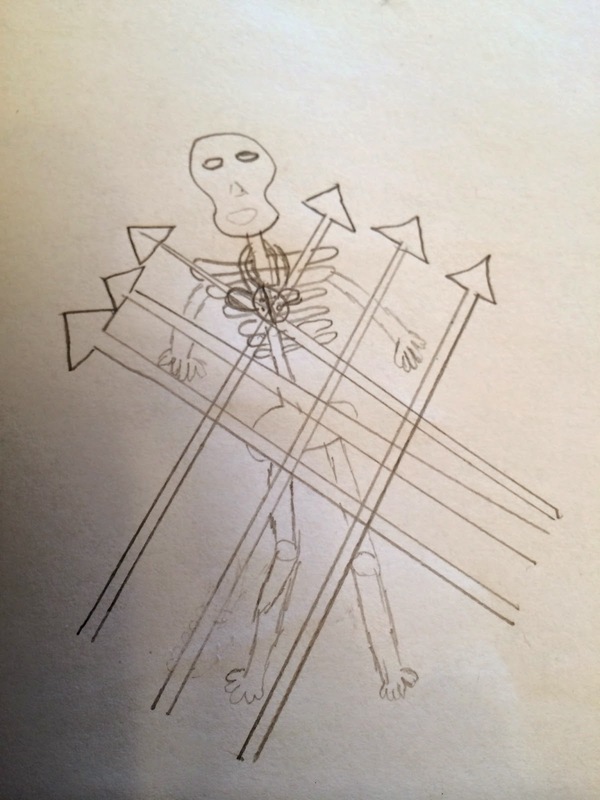 I really liked this line drawing because it shows a specific scene from The Phoenix Code; poor old Rahotep caught in the booby trap. 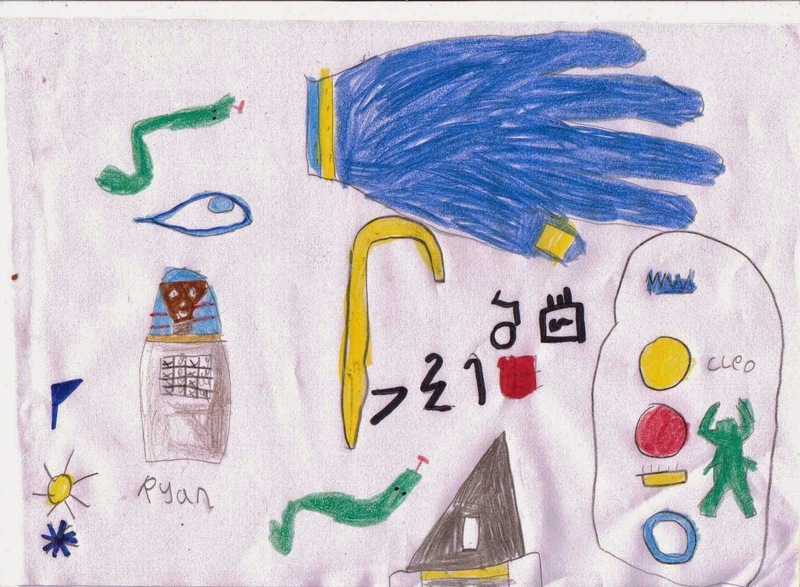 The detail that caught my eye is the scarab amulet that Ryan has hung around his neck. 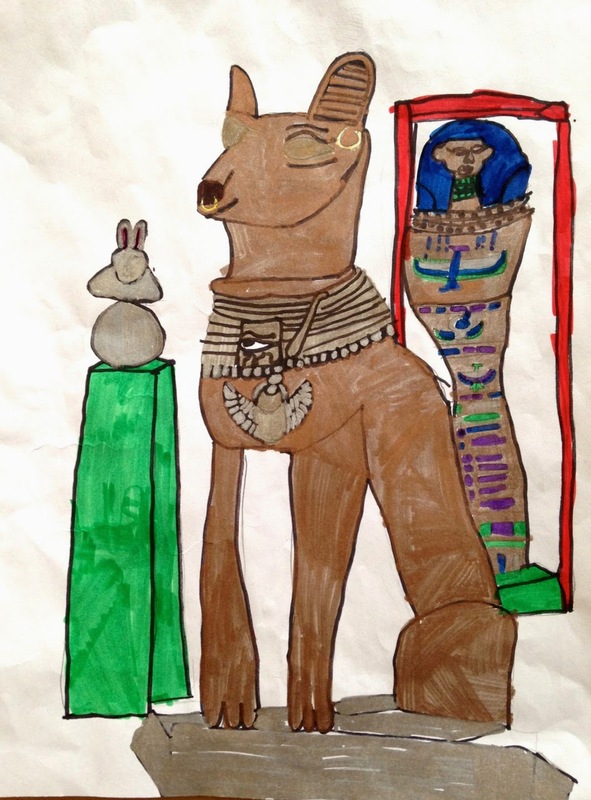 I love the colours in this beautiful drawing of a proud Egytpian cat god. There are gorgeous gold and silver tones in the original picture. 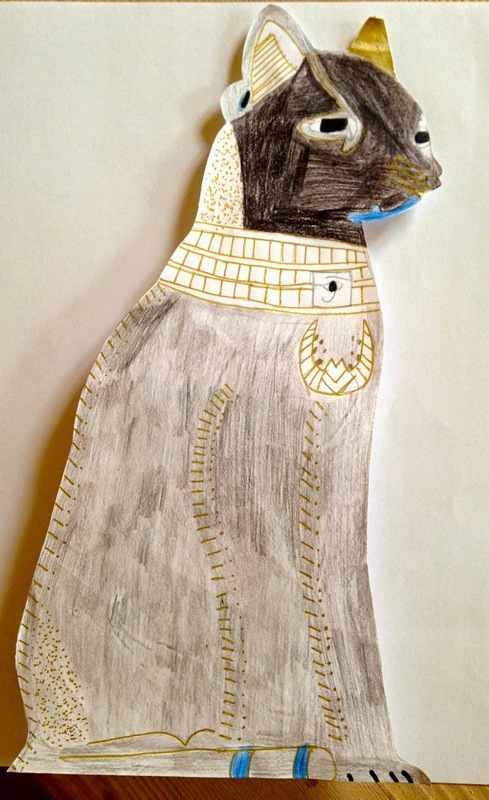 Another magficient Egyptian cat. I love all the shading detail and the way that Niamh cut out the shape of the cat (this photo shows him against a white background). 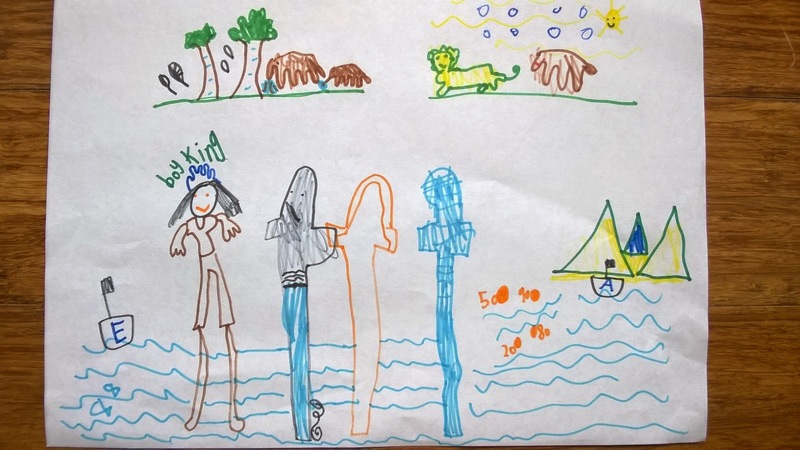 Ellie was the youngest entrant to the competition and drew this lovely scene of sailing boats on the Nile with Egyptian figures and animals on the river bank. Well done, Ellie! 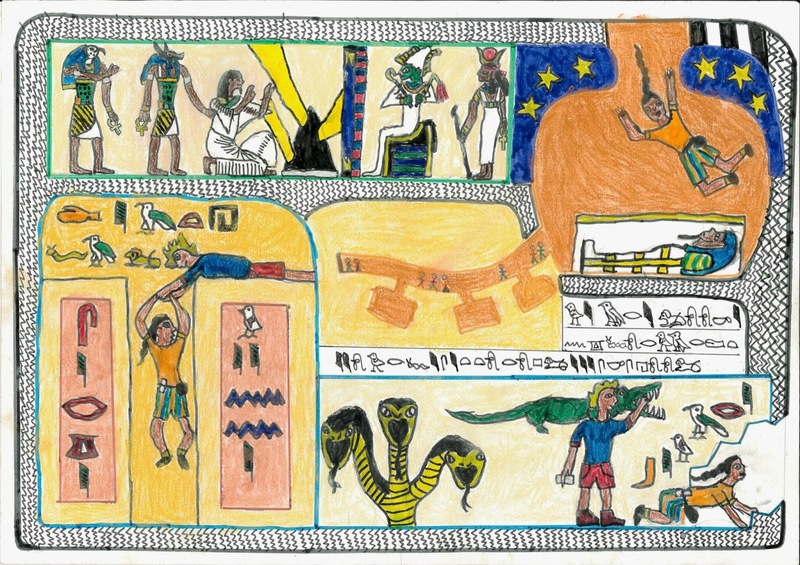 I really liked the lovely bright colours of all the different Egyptian hieroplyphs and symbols in this picture - and the inclusion of the benben stone itself. 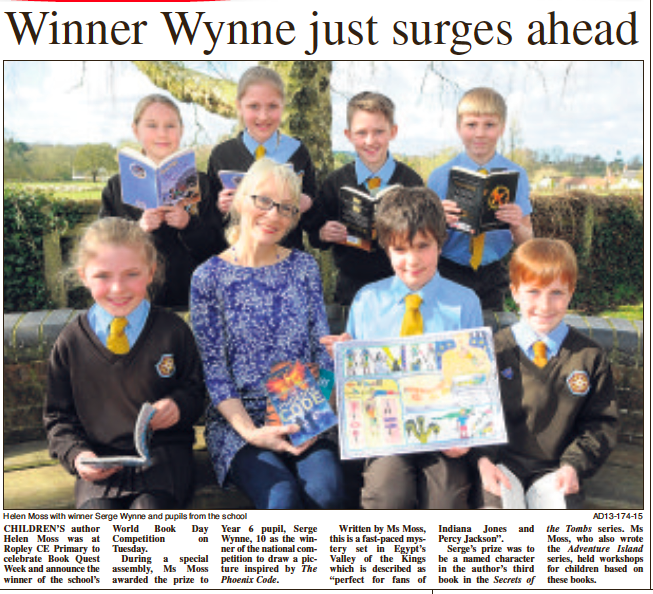 Well done to everyone who entered the competition. I'm sorry if you weren't a winner this time, but we really enjoyed seeing each and every one of your amazing pictures. Thank you for all the time and care you put into creating them and sending them in. I hope you've all enjoyed seeing the selection of top entries here. Congratulations to you all. There will be prizes on their way to our winner, Serge, and our runners-up, Chelsea and Jed.